In "Marijuana & Hemp: History, Uses, Laws, and Controversy," John McCabe details the history of the human relationship with the cannabis plant, including as a crop grown for its fiber, oil, and seed, and as a plant bred for use as a recreational drug. Throughout history the plant has been used for food, fabric, paper, cordage, fuel, insulation, building materials, resin, and a slew of other uses. McCabe clarifies the difference between the non-drug plant known as "industrial hemp" and the relative plant that gets people "high" and which is commonly known as "marijuana." Hemp fabric sails and rope are what allowed people to sail the oceans and establish naval fleets and global trade. Hemp paper was used in the earliest books, newspapers, and publications that educated people and played a role in revolutions. Hemp fabric has been used at clothing, tents, blankets, and other items for thousands of years. Currently the industrial hemp plant is unfairly tied in in laws relating to drugs and the Drug War. 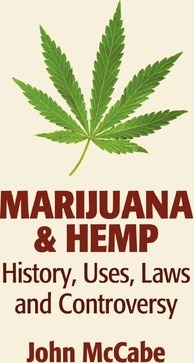 Throughout the book, McCabe quotes from scientific journals, government meetings and publications, historical texts, experts, and other sources to explain the confusion between hemp and marijuana. He details why industrial hemp needs to be legalized and why the drug laws need to be changed. It is a matter of protecting the environment, of wildlife survival, and of creating a more sustainable human culture free from restrictive drug laws that waste billions of dollars every year, endanger law enforcement workers and citizens, and destroy lives.